Okay, can someone explain why the Daleks are still a thing to me? Honestly, I didn’t want to prejudge this episode, but it was awfully hard to do knowing that it was going to involve the Doctor’s oldest and increasingly irrelevant foe. Every season the Daleks are either threatening the Earth or getting destroyed entirely forever or both. And every season they somehow come back no matter how much erasing from time they seem to have endured. It doesn’t help that the design is a product of it’s low budget sci-fi 1960’s origins. Try as I might, I simply can’t find something with a plunger and paint roller all that threatening…no matter how many deadly lasers that paint roller shoots. In the reboot of the series, we’ve seen the Daleks come back from the dead, enslave the human race, turn New York into pig men, and turn into Dalek Power Rangers. We’ve even gone to an entire planet of insane Daleks. There’s been so much, do we need to go INTO one now? Look, I get it, they are the quintessential enemies of the Doctor. They’ve been there since the beginning….but there’s only so much failure an enemy can endure before everyone begins to question why they were such a threat in the first place. Plus…I was hoping for some new enemies for the Doctor to encounter. To it’s credit though, “Into the Dalek” isn’t terrible. It’s not the strongest Doctor Who episode I’ve ever seen, but it’s certainly not the worst. It’s not even the worst Dalek episode. It actually asks a very interesting question: what happens if a Dalek decides to be good? Can a Dalek be good? And can the Doctor accept such a shocking idea? We pick up where left off last week with the Doctor getting distracted from his coffee run by a wayward spaceship under attack. After saving one of the pilots (who is less than grateful since her brother died), he discovers they have captured a Dalek. Not just any Dalek though. A sick Dalek who has suddenly developed a conscience. In order to get to the bottom of it though, the Doctor and Clara have to be shrunk and inserted into the Dalek itself. Because of course. The episode …doesn’t entirely work, but there’s still some good things to note. Peter Capaldi continues to navigate his way through the newest incarnation of the Doctor and he is in fine form here. This Doctor is definitely shaping up to be a very different character from his predecessors, bluntly being up front about the body count he manages to rack up on his adventures. This is also one of the only episodes where we get to see the Doctor do something everyone always assumes he should do: heal. At least heal in the traditional sense, first by repairing the wounded Dalek and then by playing psychologist to it later. Capaldi’s efforts to talk sense into the crazed Dalek is a great and important scene, showing that despite his hard exterior, deep down the Doctor wants to help all living things. Clara doesn’t get as much to do this time around as she did in “Deep Breath” other than to serve as the Doctor’s moral compass and re-establish that the Doctor needs companions to remind him of the man he can be. She does however get to flirt with a fellow teacher/ex-haunted soldier who we have yet to really get to know. By the amount of time devoted to his emotional turmoil however, I suspect he will be a frequent player this season. As for the rest of the episode, it verges on being something great but only really kind of good. The show has increasingly shown some pretty grisly scenarios (wearing a human face in Deep Breath and landing in a pool of deceased humans in “Into the Dalek”) which surprised me a bit. I’ll be interested to see if they continue the trend. But the reasons for wanting to help/fix the Dalek seem wishy-washy at best, which isn’t great for an episode which depends on you to care about those reasons. Then we get the mysterious Missy popping in again. Who she is and what she wants remains just as elusive as it was last week. I’m not sure how I feel about her yet…but then it’s hard to know what to feel for someone who has had just five minutes total of screen time. The fact that she has “saved” individuals who the Doctor managed to convince to give up their lives for him however hasn’t gone unnoticed. After the excitement of the first episode, it’s easy for the second not to be able to live up to it. That hasn’t diminished my excitement for the upcoming one though! 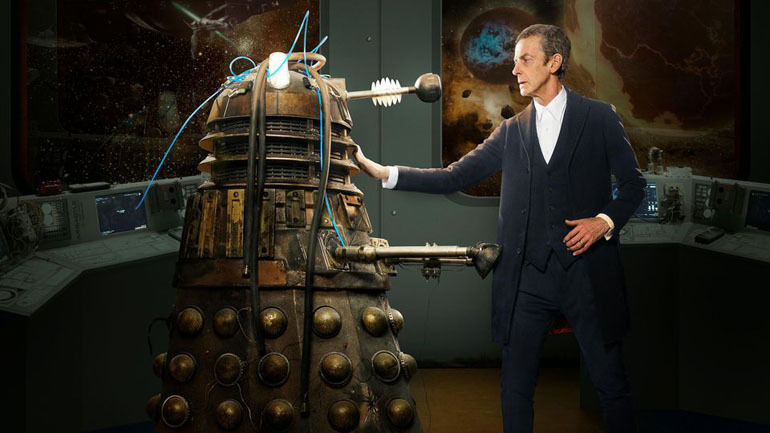 What did you think of “Into the Dalek”? Posted on September 2, 2014, in ramblings and tagged doctor who, into the dalek. Bookmark the permalink. 6 Comments. I had a similar reaction to this episode. It was just okay. I’m tired of Daleks, and though the idea of a good Dalek was certainly interesting, the way its insides worked just seemed too convenient to me. Also, it was FAR too predictable that it would immediately become bad again once it was patched up. I thought…maybe it’ll take some time, because it’s been poisoned pretty badly. Even after it was fixed, I thought it should take a while before it’s recovered from the damage it’s already sustained. I like Capaldi so far. I’m eagerly anticipating where he will settle in the role, because it takes a few episodes for new Doctors to show us who they are and how they’re their own character. As you said, he’s definitely different. I would never expect his most recent two predecessors to be so blunt and seemingly unaffected about the death of the one soldier being unavoidable, but useful. Come on, now. At least they’ve never done an episode about a Dalek that we think is good (or at least neutral) and then it turns out they’re bad when they get what they want before. I’m going to be a bit pedantic but when you said “The fact that she has “saved” individuals who the Doctor managed to convince to give up their lives for him however hasn’t gone unnoticed.” I’d like to point out that with the character in this episode, she was already contemplating the action first. With the first guy, he had to really argue and out logic the guy to give up his life. With the soldier, she was already thinking of sacrificing herself for the greater good and just wanted to make sure it was going to be worth it in the end. Still, it will be interesting to see where they go with this in the end. If I remember right, she is fond of the doctor but we all know how many crazies there are in the series and that doesn’t really mean it’s a good thing. Why the daleks are still a thing- that’s a little complicated and open to conjecture, but we think that Doctor Who did a deal with the estate of Terry Nation (the guy who created the daleks) that basically requires the BBC to put the daleks into every season somewhere or lose the right to use them permanently… This, combined with Russell T Davies’ hamfisted approach to storytelling with them (and his desperation to one-up himself every season finale) has basically poisoned the proverbial well with regards to telling stories effectively with them. On a related note, we need to sit you through a few of the classic era dalek stories to show you the daleks at their best.